Price Part Motorcycles specialise in converting Royal Enfield Bullet motorcycles to run on diesel fuel. The motorcycle enters our workshop where it is totally dismantled, the frame is then adapted to take the diesel engine mounting. The Engine is a 406cc single cylinder direct injection diesel engine 10hp @3600 rpm, either kick start or direct electric start. There is now the option of the 456cc single cylinder direct injection diesel engine 13hp @ 3600 rpm. 14 amp hour capacity battery fitted to electric start version. Gearbox is completely stripped cleaned and inspected, new sealed bearings, gaskets and seals are fitted as routine. All springs and kick start parts are replaced, all gearchange parts are replaced, new layshaft bushes & bearings replaced. New final drive sprocket seals & locks fitted. We recommend either an 18 or 19 tooth sprocket. New special longer main shaft is fitted. New wheels and brakes, the wheel rims are WM2 x 19 stainless steel. A special outboard gearbox mainshaft bearing support is fitted in primary drive case. A complete new clutch, engine sprocket, primary drive chain and special inner primary case is used. The main frame is powder coated to a high standard gloss black, as well as all small fitting parts, ie foot rests, mudguard brackets, stays, engine mount, etc. All other parts are painted high gloss and lacquered. All new electrical switches, wiring looms and lights are fitted. New seat, either dual or single seat if specified. Wheels are rebuilt with new stainless steel rims , either new hubs are used or existing ones shot blasted and re powder coated. New steering stems and bearings, forks are either reconditioned or replaced as required, new rear shocks. Avon speedmaster tyres fitted as standard. Other tyres are available on request. On completion a new mot and road test. 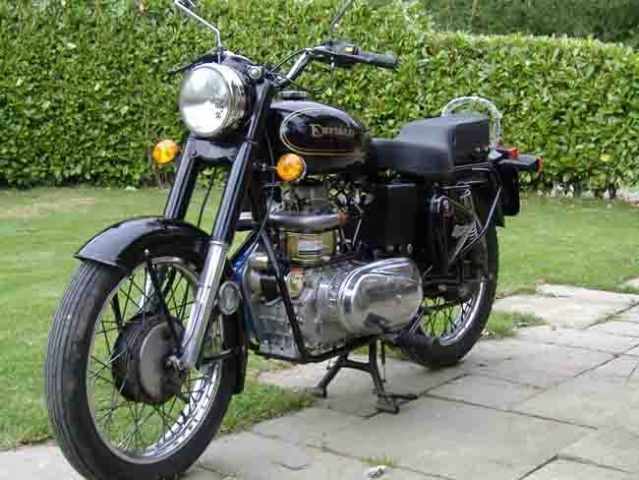 Newly available pre 1972 Diesel powered Royal Enfields, Historic Road tax, Black/white rear number plates. a real classic.